The economic recovery has brought new opportunities in real estate investment, and hotel acquisitions seem especially well positioned to benefit from rising asset values and the recovering capital markets. The U.S. hotel industry closed 2011 with increases in occupancy, ADR and RevPAR. While the industry is not back to 2007 and 2008 levels, 2012 shows signs of continuing this upward trend and opening a new window of opportunity. 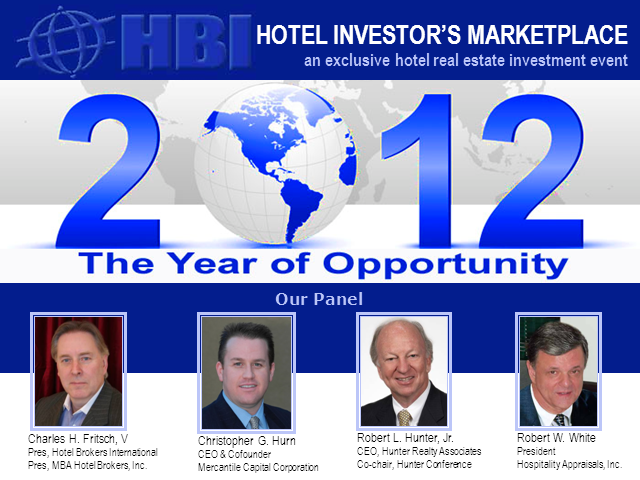 Join the Hotel Investor’s Marketplace Webcast as our panel of industry professionals discusses 2012: The Year of Opportunity. President, MBA Hotel Brokers, Inc.
CEO, Hunter Realty Associates, Inc.